CFSI’s Financial Health Visionary Award recognizes individuals who have shown unparalleled leadership toward building a more accessible and inclusive financial system, and seek to continue to inspire and encourage the next generation of leaders to innovate new solutions for the financially underserved. 2018 marks the debut of the award, aligning with CFSI’s support for and recognition of individuals who have embraced financial inclusion as a key business strategy that can drive bottom-line business benefit hand-in-hand with social impact for individuals and small businesses around the world. 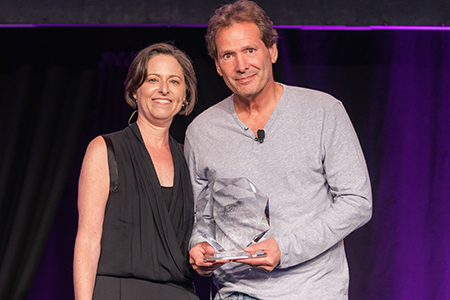 CFSI was pleased to present Dan Schulman, President and CEO of PayPal, with its inaugural Financial Health Visionary Award at the 2018 EMERGE: Financial Health Forum. Dan is a committed and consistent advocate for the role of business and technology in improving the financial lives of millions of customers around the world, and he’s passionate about supporting the next generation of financial health leaders. You can learn more about Dan here. Dan Schulman, President and CEO of PayPal, speaks with Jennifer Tescher, President and CEO of the Center for Financial Services Innovation, live from EMERGE: Financial Health Forum. Jennifer and Dan discuss how to improve financial health of the underserved, innovation in the financial services sector and how leaders across sectors can work together to create long-term, positive impact.